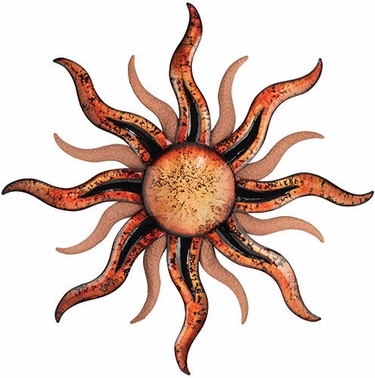 For a contemporary take on the ancient sun symbol, we proudly delivery our Sante Fe Sun metal outdoor wall art! With its new marbled lacquer finish and embedded sand on the rays, this is a beautiful and unusual piece that would make any outdoor space or dull indoor wall instantly come alive. The curved rays and dark highlights suggest something vibrant and in constant motion, and this outdoor sun wall hanging would look beautiful with black wrought iron furnishings on a patio or backyard deck. For outdoor wall art near your garden, metal sun ornaments are ideal, and the lacquer finish makes this piece safe for outdoor use. Indoors, this sun wall art can add a burst of color to a white office wall or to offset wood furniture and add new life to a subdued room. Its large 36 inch size makes a dramatic presentation anywhere. The easiest way to bring Sun all year long into your home and garden is with a fabulous piece of Sun Decor. Our favorite New Santa Fe Sun Wall Art will absolutely blow you away! Size: 36" x 36" inches.